There are two kinds of guitarist, those who know their fretboard and those who don't. If you're in the latter camp you might be curious to know what advantages you are missing out on. Spend much time on guitar sites and you'll see plenty of adverts for methods to have you memorize your guitar fretboard easily and quickly. With all these offers it surely seems that knowing the fretboard is important. But just what are the reasons why? Here are some of the benefits you will you get from better fretboard knowledge. When you know your fretboard you can easily find chords without having to think for ages about it. This means you can glance over a song's chord chart and instantly and easily play it. You can also find chord positions that are close to each other so you don't have to jump around the fretboard as much. Alternatively, if you play with another guitarist you can find a different place to play the chords so you don't both play the same thing. Being able to build a scale from any place on the fretboard is a useful skill. Wherever you find your fingers you will know how to create little scale licks or melodies to embellish your chord playing. Of course, this ability also comes in handy for playing solos and leads on any song. When you develop your ears with ear training you can easily apply your skills to your guitar to play the notes you hear. A good knowledge of the notes on your fretboard helps to reinforce ear training. As you hear notes with your ears you can instantly see where they occur on the fretboard which gives you an additional reference for comparing notes. Building your ear skills also helps to reinforce your fretboard knowledge as they are simply two different ways of thinking about notes in music. The two skills provide representations of notes for three of your senses, the sound, the vision of where the note occurs, and the feel of playing that note. When you know how to play any note or chord on the fretboard sight reading is made easier. If you have to think much about how you are going to play the notes you read then you give yourself a lot of mental work to do. You will be unable to play fast enough while you read and probably make lots of mistakes. When you can think easily in terms of notes instead of fretboard positions or patterns you can communicate with other musicians more easily. You can't communicate with a trumpet player by talkign about the "5th fret 2nd string", but if you tell him you play an E he'll instantly know what you're talking about. Notes and intervals are the language of music, not the guitar fretboard. Of course, simply memorizing the names of all the notes and their fretboard positions won't automatically make you a better player. You could memorize all the note positions without being a guitar player. You have to learn how to play and when to play the notes, how they relate to each other, understand chord shapes, intervals, and scales. But couple the skills of playing chords, scales and licks with detailed and instant knowledge of the notes on your fretboard and you will take your guitar playing to a new level. The fretboard NEEDS to become your best friend. In fact... it is your best friend! Treat it like so, and it will return the favor. 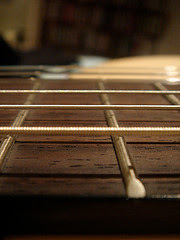 Hi CME, looking at the fretboard as a friend is a good idea. Nice looking guitar shop you have there.